War of Will (photo via Coady Photography). 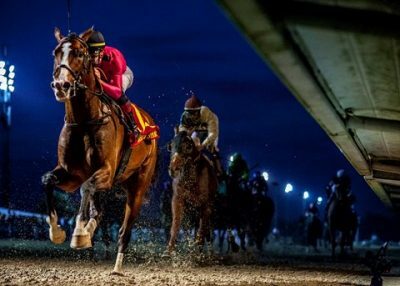 Despite the fact that only two horses in history have completed the Louisiana Derby (GII)-Kentucky Derby (GI) double, the signature race of the Fair Grounds meet is still one of the most important stops on the Triple Crown trail. Before points determined who would make the gate for the Run for the Roses, graded purse money was the most prominent determining factor and even before the New Orleans-based track boosted the purse to $1 million, the 1 1/8-mile race has featured some exceptional horses attempting to make the Derby starting gate. The Louisiana Derby is the first of seven races this season to offer 100 points to the winner, with 40, 20 and 10 on the line for second through fourth. The winner will certainly earn enough to make the Derby starting gate, as last year’s cutoff was 29 points for Instilled Regard and, the year before, it was 30 for Sonneteer. Black Gold (1924) and Grindstone (1996) are the lucky two to have swept both the Louisiana Derby and Kentucky Derby, but that’s not to say some good horses haven’t run in the Pelican State’s main Derby prep since it was first contested in 1894. Risen Star won in 1988 before taking the Preakness Stakes (GI) and Belmont Stakes (GI) and 2017’s Horse of the Year Gun Runner won in 2016. Other recognizable names to win the Louisiana Derby throughout the years include Friesan Fire, Circular Quay, Peace Rules, Master Derby, Rushaway and many more. Nobly Indy won last year. Trainer Todd Pletcher has sent out four Louisiana Derby winners (2007, Circular Quay; 2010, Mission Impazible; 2013, Revolutionary; and 2018, Noble Indy) to hold the current record of most winners. Hall of Fame jockey Pat Day owns the victory record for riders, having booted home five (1986, Country Light; 1987, J.T.’s Pet; 1991, Richman; 1992, Line in the Sand; and 1997, Crypto Star). The fastest time for the race at this nine-furlong distance remains the 1:48 2/5 Clev Er Tell posted in 1977. The weather in New Orleans on Saturday is expected to be beautiful and warm with highs in the low 70s through partly sunny skies. Roiland – Trainer Tom Amoss hasn’t yet won this race despite all of his career success at Fair Grounds (11 training titles) and neither has jockey James Graham. This one will like a fast early pace, as he didn’t even get going in the LeComte (finished seventh) or the Risen Star (third) before a half-mile, and this late runner should also appreciate the added distance as he broke his maiden at 1 1/16 miles at Churchill in November. Lemniscate – makes his stakes debut after breaking his maiden on the Gulfstream Park turf in gate-to-wire fashion last out at 1 1/16 miles. Repent won this race for trainer Kenny McPeek in 2002 and Brian Hernandez Jr. was aboard Girvin in 2017. Limonite – This Winchell Thoroughbreds-owned son of Lemon Drop Kid makes his second start as a sophomore for trainer Steve Asmussen, who won this race three times before with Fifty Stars in 2001, Pyro in 2008 and Gun Runner in 2016. Jockey Jose Ortiz seeks a first Louisiana Derby. Sueno – Keith Desormeaux is a Louisiana native, but has yet to win Louisiana’s signature race and this year sends out Sueno off a runner-up finish in the Southwest Stakes (GIII) at Oaklawn Park. Corey Lanerie returns after the last and has yet to win a Louisiana Derby. By My Standards – faces winners and makes his stakes debut for the first time after an off-the-pace victory by 4 ½ lengths around two turns here for trainer Bret Calhoun. Jockey Gabriel Saez won this race in 2007 on Pyro. Trainer and jockey have been winning at a 33 percent clip together for the past 60 days. War of Will – the current points leader (with 60) rolls into this event on a three-race win streak including the LeComte (GIII) and Risen Star Stakes (GII). Trainer Mark Glatt and jockey Tyler Gaffalione are both so far winless in this event. Mr. Money – makes his second start as a 3-year-old and was seventh last out in the Risen Star after finishing fourth in the Nov. 3 Breeders’ Cup Juvenile (GI). Jockey Adam Beschizza is a Louisiana Derby rookie and this is Bret Calhoun’s second runner here. This colt from the first crop of two-time Breeders’ Cup Mile (GI) winner Goldencents. Country House – makes his fifth start at his fourth track for trainer Bill Mott, who doesn’t ship into Louisiana much, but after his nice second in the Risen Star Stakes (GII) last out, stays for this race. He is a later runner who will like a pace to run at under Luis Saez, who has yet to win this race as well. Bankit – is another for Asmussen, but this one has his work cut out for him. This New York-bred son of Central Banker won the Sleepy Hollow Stakes and was second in the Remington Springboard Mile but hasn’t progressed much in two stakes at Oaklawn, so ships to Louisiana looking for a better shot. Irad Ortiz Jr. has yet to win this race. Spinoff – The well-bred son of Hard Spun and the Grade 1-winner Zaftig enters here for Todd Pletcher off an impressive 11-length victory in a mile and 70-yard allowance win at Tampa in mid-February. Jockey John Velazquez rode two Louisiana Derby winners, both for Pletcher, last year on Noble Indy and in 2007 on Circular Quay. Hog Creek Hustle – gives it another shot to earn more points off a fourth in the Risen Star (GII) last out. He has nine points so far, so he’d need to hit the board to have an hope of moving down the Triple Crown trail. 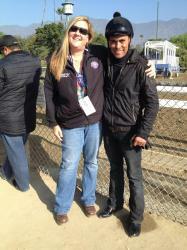 Trainer Vickie Foley and jockey Miguel Mena have yet to win this event. The Louisiana Derby has been carded as the 13th on the day with a post time of 5:13 p.m. CT.